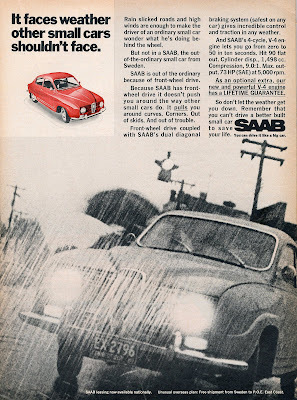 The weather in Detroit is tough to face, but not if you've got a front-wheel drive Saab 96. With 73 HP of V-4 fury, low drag aerodynamics, and diagonally split brake circuits, it could take on just about anything. Except maybe the financial Apocalypse. I assume after Saab has completed its "winding down" GM will not honor the LIFETIME GUARANTEE on Saab's V-4 engine.